HSD received this three-year grant from the Department of Justice, Office of Juvenile Justice and Delinquency Prevention, to replicate components of the nationally recognized Chicago Cure Violence and Kennedy Ceasefire models. Oakland is one of only four cities in the nation to receive this prestigious grant. This project expanded upon street outreach efforts, allowing for the number of street outreach workers to approximately double, and initiates a public education campaign. HSD, in partnership with Alameda County Health Care Services Agency and Alameda County Probation received an intial one-year grant from the Office of Juvenile Justice and Delinquency Prevention for further development of the Oakland Unite Juvenile Justice Center (JJC) strategy designed to ensure Oakland youth are reconnected with school immediately upon release from juvenile detention.Subsequently, DHS was awarded a one-year continuation grant, and most recently, in 2012, DHS was selected as one of five recipients across the country to receive additional funding to continue Second Chance services and participate in a national evaluation grant. Building upon the successes of earlier efforts, these DOJ grant funds have enabled more reentry youth to be served, and have enhanced system changes for the most at-risk reentry youth in Oakland. Collaborative partner include: Alameda County Probation, Alameda County Health Care Services Agency (ACHCSA), Oakland Unified School District (OUSD), Bay Area Legal Aid, and Oakland Unite funded Juvenile Justice Center (JJC) strategy case management agencies. HSD was awarded an additional two years to the original four-year transitional employment and placement grant from California Department of Corrections and Rehabilitation (CDCR) to continue to implement the Golden State Works program (GSW). CDCR partnered with Caltrans and Bay Area non-profit, Roberts Enterprise Development Foundation (REDF), to develop a transitional work crew employment program for Oakland residents on parole modeled after the best practice developed by Center for Employment Opportunities (CEO) in New York. The program enhances maintenance of Caltrans right-of-ways in Oakland while providing formerly incarcerated residents with transitional employment, life skills, job readiness training, employment search skills, and placement in permanent jobs. HSD, in partnership with OPD, Alameda County Probation, received state funding that continued to support the implementation of the Oakland Ceasefire Program through December 2013. Ceasefire is an evidence-based collaborative program that is designed to reduce violence and homicides in the City’s high-stress areas. Ceasefire is based on work promoted by David Kennedy, director of the Center for Crime Prevention and Control at John Jay College of Criminal Justice in New York City, and adapted to local conditions. HSD received funding from this private foundation to increase capacity for Ceasefire case management and to support the Oakland Unite Ceasefire client engagement program, which together help the most at-risk young adults in Oakland take steps towards making positive changes in their lives. This donation is intended to fill immediate short-term gaps that have arisen as Ceasefire Call-ins continued to gain momentum over the past year, while HSD and Ceasefire partners seek additional, longer-term support for the service component of Ceasefire. 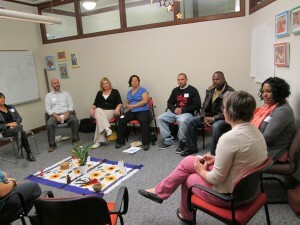 Oakland Unite staff provide capacity building and technical assistance for grantees and special projects. In addition to quarterly Grantee meetings and ongoing CitySpan database trainings, staff has offered a professional development series including topics such as Immigration Community Resources, Avoiding Burnout and Trauma Informed Care. The Oakland Street Outreach teams receive bi-annual extensive week-long training. Similarly Street Outreach case management technical assistance was provided through the CalGRIP grant. The Community Violence Demonstration grant also provides technical assistance to the street outreach team to embark on a public education campaign.The Juvenile Justice Center Strategy has provided legal advocacy trainings through the Second Chance Juvenile grant.